The sixth nationwide Prescription Drug Take Back initiative sponsored by the Drug Enforcement Administration is taking place tomorrow and the Kosciusko County Sheriff’s Department is taking part. The Drug Take Back events have proven to be a popular and safe method for the public to legally and safely dispose of prescription drugs that are no longer needed or have expired. Collection sites will be set up nationwide where police officers will be collecting expired, unused and unwanted prescription drugs that will be destroyed. This service is free and anonymous with no questions asked. The only restriction is that authorities will not accept new or used needles. This program is intended for pill medications. 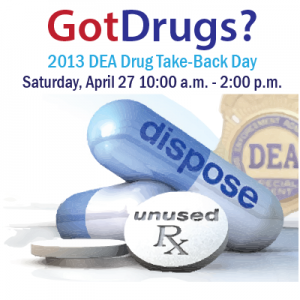 Citizens wishing to participate in this program may drop off their prescription drugs for disposal at the Kosciusko County Sheriff’s Department from 10 a.m. to 2 p.m. Saturday. There will be a collection point near the permanent Prescription Medication Drop-Box located at the south end of the county parking lot. To locate a collection site closest to your home or business, click HERE.